Ketchup & fries tote: From Etsy, "ketchup and fries are BFFs, and now you can celebrate their friendship by sporting this purse." French fry love: A handmade greeting card that says "I love you like I love French fries," also from Etsy. 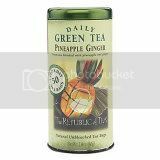 Pineapple Ginger Green Tea: According to The Republic of Tea's website, this tea "helps you simultaneously relax and pay attention." I tried it at Kitchen Conservatory one day and loved it! Beemster X.O. Extra Double Aged Gouda: I've haven't tried this yet, but the description on igourmet.com sounds intriguing. "We experienced a moment of culinary divinity when we first sampled this double-aged Gouda. 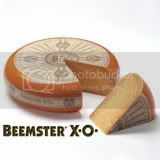 Previously, we doubted that any cheese could be more flavorful than Beemster's 18-month Aged Gouda, but their X.O. indeed sets a new bar. With this 26-month Gouda, we first noticed its delicate, brittle texture. After we tasted it, the flavors of butterscotch permeated the palate, followed by alternating waves of whiskey and pecan." I'm saving my pennies so that I can buy a $16.99 pound. Blake Makes: This guy gives away free food on his site! Blake recently held a little contest; to win a jar of fig & ginger chutney, you had to leave a comment explaining what you'd make with it. I said I'd want to try it as a glaze on slow-cooked spare ribs. And I won! I'm looking forward to getting my chutney on! Shop 'n Save: I usually loathe this supermarket. It's a leave-things-in-open-boxes-on-the-shelf kind of place where you have to bag your own groceries. I typically avoid it like the plague, but sometimes I stop in because it's the only grocery store between work and home. It's always filled with slow old people who block the aisles and mothers with too many rowdy kids. I get frustrated because I don't know where things are located there. However, I've noticed that they carry some interesting products that I can't find elsewhere in town...like soba noodles and great cheeses. So, last weekend I planned my weekly shopping at Shop 'n Save, took my time going through each aisle, and was pleasantly surprised by what I found and how cheap things were! James Beard quote: "A gourmet who thinks of calories is like a tart who looks at her watch," from Margaret's Food Buzz page. I am having the Republic of Tea Pineapple Ginger iced right now - I added a slice of orange and some mint from the garden and it's like I am on vacation - right here at my desk! Also - have you tried Hawaiian Poke? I made it fresh last night and it was the bomb! I've never had Poke? Care to share the recipe? Kelly, I can't finish reading your Friday Favorites because I have to go find some french fries, NOW. I just wanted to go on record and say that Gouda is hands down my favorite cheese, especially on a sandwich with bacon. K I need to go to Bread Co and eat their Bacon Turkey Bravo now lol. Have you ever tried aged gouda? It's hard and crumbly like parmesan...with tiny, crunchy bits of salt. So good! Glad you liked the diner shoe post! If you get them, you're going to have to wear them to the next food blogger pot luck!